Analysis: Could Hogan get sacked in push to keep Redskins in Md.? Whether he appreciates it or not, Maryland's governor is hitching his wagon to an enterprise — the Redskins — that is in full-fledged crisis mode. Will it work for him? Maryland Gov. Lawrence J. Hogan Jr. (R), riding high after securing a second term, appears poised to spend some of his political capital working to keep the Washington Redskins from leaving the state. The governor has recently provided details about discussions he has had with the Trump administration about a possible land swap that would give Maryland a parcel in Prince George’s County, near the Woodrow Wilson Bridge, that could one day be the site for a new Redskins stadium. Whether he appreciates it or not, Hogan is hitching his wagon to an enterprise — the Redskins — that is in full-fledged crisis mode. And his strategy appears to rest on the discredited notion that NFL stadiums generate enough economic activity to justify the public investment they require. When Maryland officials were first wooing the team to the state – at the same time they were scrambling to find a replacement for the recently departed Baltimore Colts, who fled in 1984 – the Redskins were coming off two straight decades of on-the-field success, including a Super Bowl victory as recently as 1992. That seems like ancient history now. 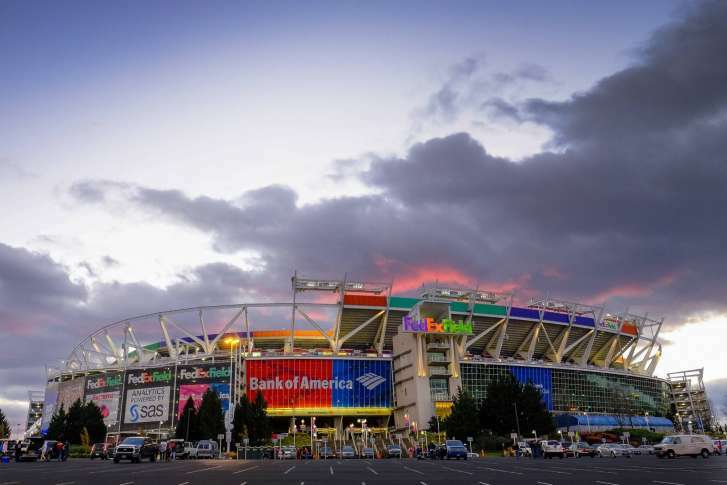 While the Redskins have a lease on their current stadium, FedEx Field in Landover, that runs through 2027, jockeying has already begun among the likely bidders for a new stadium — Maryland, the D.C. and Northern Virginia. Hogan and his team know that the window for him to get stuff done is finite, and he’s likely to enjoy more momentum and public support in the upcoming General Assembly session, when he’s fresh off a successful reelection campaign, than at any other time. But the Redskins are widely viewed to be a dysfunctional mess — a habitual loser on the field, with a remote, isolated owner who is despised, and a fan base that is by turns angry and apathetic. For years, the Redskins falsely boasted they had a season-ticket waiting list. Faced with the reality — that most games are played in a partially-filled stadium — the club removed thousands of seats, to make the stadium seem less empty. While journalists and fans differ on what the Redskins should do to bring back the magic that accompanied the team’s heyday, it’s an article of faith that owner Daniel Snyder is a toxic mix of incompetent, aloof and tone-deaf. The Redskins have missed the playoffs 15 of the 20 years he’s owned the team. They have won just one playoff game during his tenure. And they are the only team in the NFL not to have at least one 11-win season since 2001. Hogan has defended his strategy for keeping the Redskins in Maryland. He recently told reporters that the state will not have to pay for stadium land because of his negotiations with Interior Secretary Ryan Zinke (who has since left his post). The state would swap land it owns in Western Maryland, near historic Civil War sites, in exchange for the land in Prince George’s that Hogan is envisioning for a football stadium. But the governor stressed that he has no intention of having the state build the stadium. But that leaves the infrastructure costs. Hogan will have to make the case — with the General Assembly and the public — that connecting the Oxon Cove land he is eyeing to nearby roads (the Capital Beltway, MD 210 and DC 295) and, possibly, a Metro extension across the Woodrow Wilson Bridge, would be a prudent use of taxpayer money. It won’t be easy, in part because Hogan will be advocating alongside an entity that retains little of its once massive store of public good will. House Speaker Michael E. Busch (D-Anne Arundel) has already expressed reservations about such expenditures, and others are likely to do the same. “It’s a significant amount of state money that would be required to deal with the infrastructure challenges of that location,” said University of Mary Washington political science professor Stephen Farnsworth. In addition, Farnsworth said, lawmakers will vigorously push for other uses of those dollars. Farnsworth noted that the Baltimore Colts’ decision to leave for Indianapolis in the middle of the night still stings for many old-time Marylanders. For that reason, he said, Hogan has to be vigorous in his campaign to keep the Redskins, even if it doesn’t pan out.